Much to my husband's mild amusement, I am always searching for something new and exciting to explore. Granted, my definition of "exciting" might be on the lower end, but I'm a stay-at-home mom with three kids age five and under, you do the math. 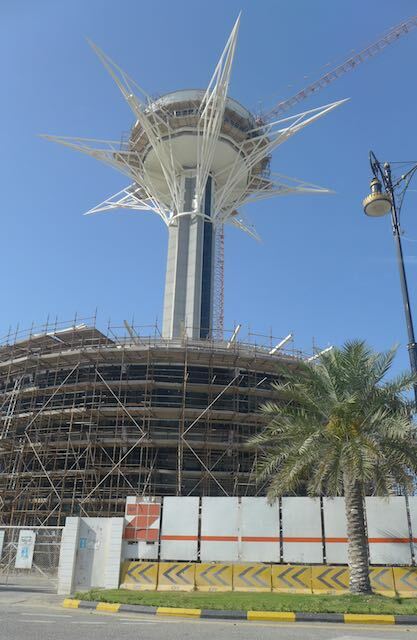 As I was poking around online amassing a list of sites to check out in Bahrain, I came across several references to a Tower restaurant that sat on an island between Bahrain and Saudi Arabia. Sounded intriguing. Time Out Bahrain said: "Perched high above the border crossing between Bahrain and Saudi Arabia, the restaurant offers stellar views out over the sparkling waters of the Gulf." Well, say no more. I'm in! There are two things I should point out at this stage. First is that the article was written in 2009. Second is that I did not read further down where they actually offered information such as a phone number (17690674) and hours of operation (daily, 9 AM to 11 PM). Had I seen his information I might've called the number and found out that it's been disconnected. I'm not saying this would have swayed me from further exploration, but at least it might have given me pause. Possibly. 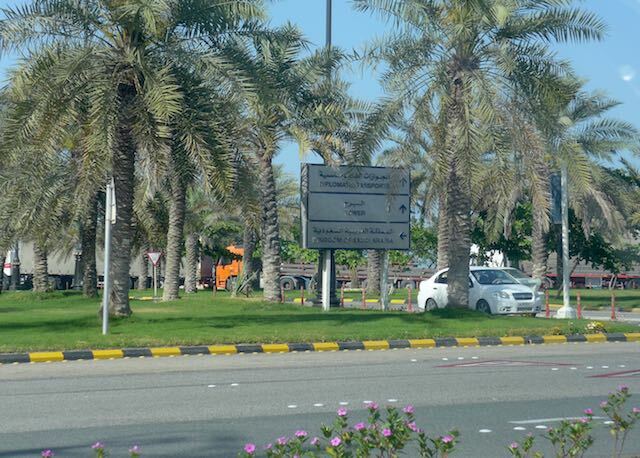 I did learn from this article that it was called the King Fahad Causeway restaurant. This gave me more search terms and I came across Lonely Planet's opinion: "For an egg roll-up and chips while watching the sun dip behind the Saudi mainland at sunset, try the King Fahd Causeway Restaurant, halfway up the tower on the Bahraini side." Wikipedia offered a wealth of information. I learned that the island was officially called Passport Island, or Middle Island (apparently creative energy was low during the naming process), and was officially opened in 1986. It is actually made up of two artificial islands that are connected. This way each country can have their own island. As a mother of two little ones I can appreciate that greatly; less squabbling. Even Wikipedia mentioned the 65-meter high (200+ feet) tower restaurant. So I became completely convinced that this would be one of those little hidden gems I love to uncover. My husband came up with a dozen reasons why we shouldn't bother; probably not even open, probably not even there anymore, probably too dangerous to actually go up, probably pollution too great to see anything, probably get caught in hours of traffic, blah, blah, blah. So one afternoon I set out on a recon mission to prove him wrong. I packed up the kids and my ever-patient visiting mother in the car and we headed out. Our first stop, literally, was the tollbooth as we left Bahrain's mainland. I had to pay 2.5 BHD, which is about $6.50, but then we were truly off! The bridge itself is said to be 15.5 miles long. I'm not sure whether Passport Island sits directly in the middle of that, or not, but it was certainly an easy drive and we even got to see some boats out on the water. As we approached Passport Island, even through the haze, we could see the Tower off to the right. Intrigue continued! As soon as we drove onto the island we passed through a traffic light and at the last moment I noticed a sign saying "Tower" indicating I should've turned right. The sign was beyond the light and parallel to the road I was on so I'm not sure how anyone was supposed to see it. Having missed it, I immediately started looking for a way to turn around but I also quickly realized there was another tollbooth immediately in front of me. I assumed this was the tollbooth to Saudi. I knew I had a few issues, namely that none of us had our passports and that it was illegal for me to drive there. Seeing a break in the police barricade, I did a quick and dubiously-legal u-turn maneuver that got me heading back the other way. But now I had to pass through yet another tollbooth. When it was my turn, I explained to the guy in the booth that we had just come from Bahrain and we were trying to get to the Tower restaurant. With great apathy he passed me through (no charge). I came back to the first traffic light and made a left following the sign for "Tower." Less than a minute later we were parked next to a massive construction site surrounding the "Tower." Or what I assumed was the "Tower". I was a little flummoxed as to why the tollbooth operator didn't happen to mention, in Arabic or English, that the restaurant was quite obviously closed for a very long time. Maybe he saw the hopeful look on my face and didn't want to dash my dreams. Oh well, we tried. 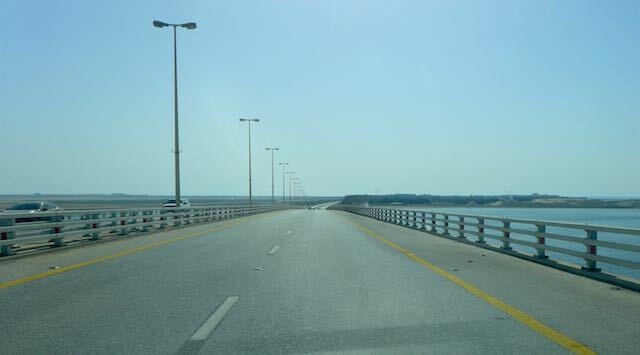 We hopped back on the causeway, and headed over the bridge towards Bahrain and home. Actually it was a nice view seeing our island home from this perspective (minus the layer of haze). As much as I hate to admit it, my husband's predictors of failure were correct in this endeavor. But I shall not let it sway me from further explorations! Now where shall we head to next?